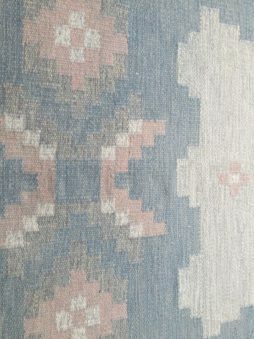 Mid-Century Rugs | Interior Boutiques – Antiques for sale and mid century modern furniture, french furniture, antique lighting, retro furniture and danish furniture. 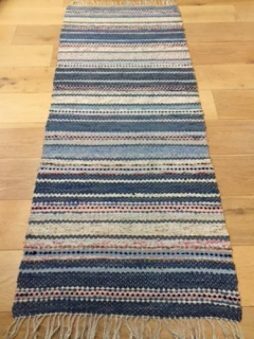 A lovely Handwoven rug in near perfect condition. 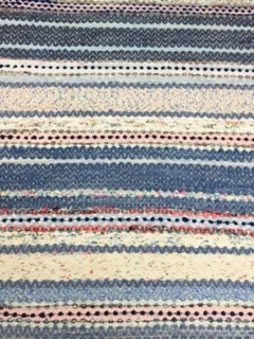 Made using beautiful shades of blue cotton. 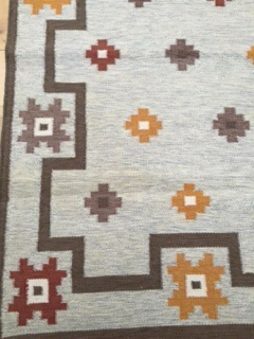 A fabulous rug! 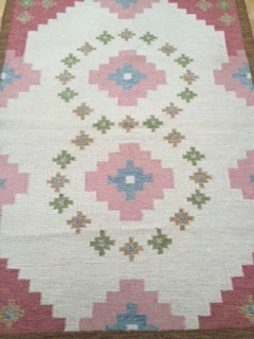 A lovely 1950/60’s flat weave rug in perfect condition. 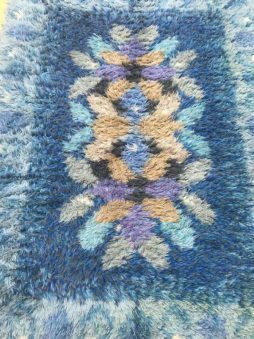 Woven using soft colours. Light blue with a hint of pink. The weaver’s initials are clearly seen as shown in the pictures. 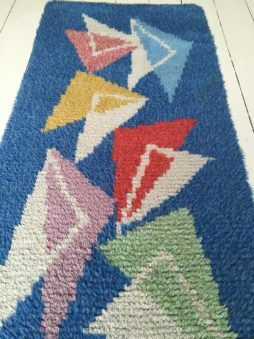 A lovely 50's Swedish flat weave rug. Woven in soft muted colours. As you are able to see in the pictures, there are stains and due to it's age has slight discolouration. Fringes show wear. In pointing this out, it is still a firm favorite of mine and doesn't detract from it's overall look. It's condition is reflected in it's price. 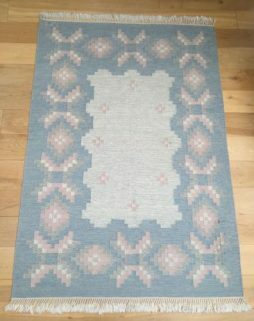 As featured in House & Garden Magazine, a beautiful 1960's Swedish hand knotted Rya rug in perfect condition. The base colour is a vibrant blue with a border of cream leaves. 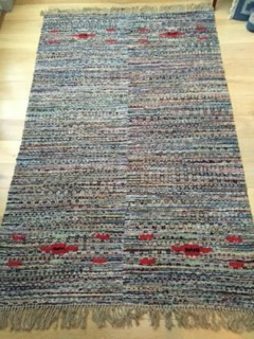 A lovely example of a Swedish 1950's Hand knotted rug in perfect condition. The colours are true and clear. The rug has been cleaned. 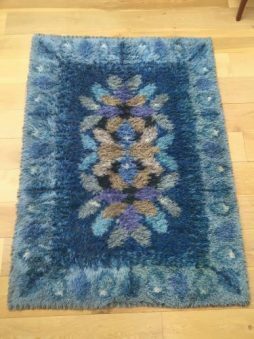 A fabulous hand knotted Swedish rug designed by Ingegerd Silow. Beautiful clear blue colours forming a floral pattern. Ingegerd Silow (1916-2005) was born in Stockholm and became a well known textile designer. She attended The School of Art and Design in Stockholm and sat on the board for Sweden's Association of Handicrafts. 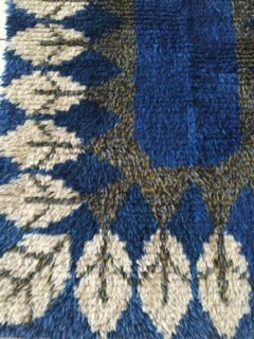 She was commissioned by well known leading textile companies to design flat weave (Rölakan) and hand knotted (Rya) rugs. 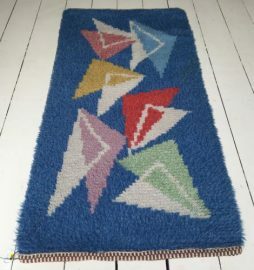 Her rugs are highly sort after not only in Sweden but all over the world. 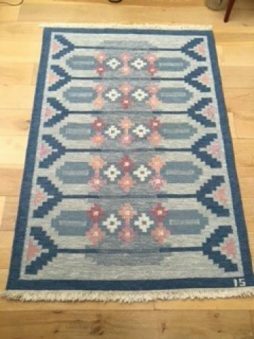 A fabulous Swedish flat weave (Rölakan) rug with the weaver's intitals CB. 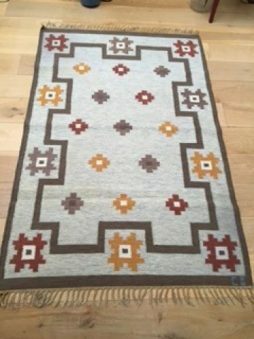 The design of the rug is typical of the period and is what gives it it's charm. 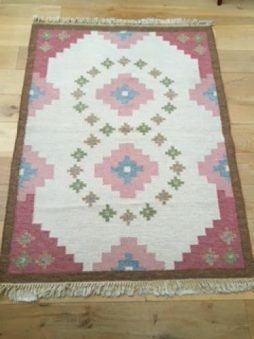 The condition of the rug is good. The fringes show wear. It is possible to remove the fringes and replace with a band. 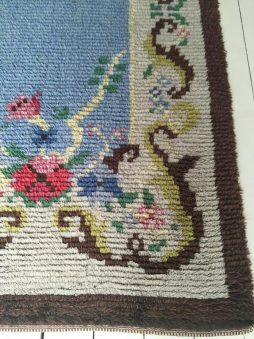 The last two pictures show the reverse of the rug. 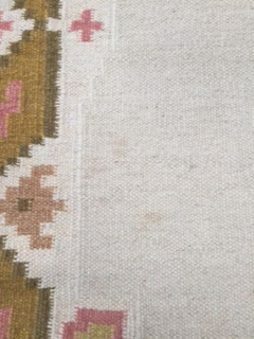 The wool has strands of light brown in it which can look as if it is a stain. I have tried to show this in the pictures. Please note that it is not a stain. The rug has been dry cleaned. 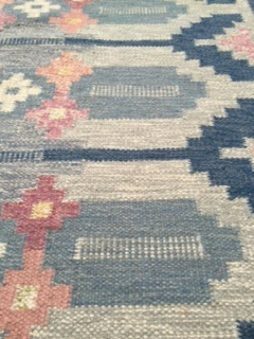 A beautiful Swedish hand knotted rug. Made in the 1950's, it's in perfect condition with no colour fading. A lovely traditional design! 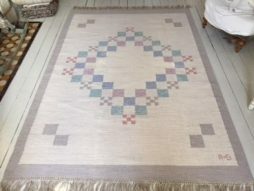 A beautiful Swedish flat weave rug woven in lovely soft colours. 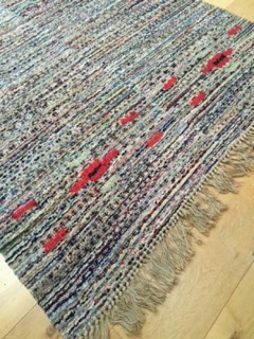 The rug is in near perfect condition and has been dry cleaned. 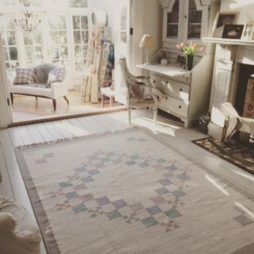 As featured in Homes & Antiques and House & Garden, a wonderful Swedish flat weave rug from the 1950's in perfect condition. Soft muted colours with a geomatric design. Please note that there are 3 small staines which I have included in the pictures. 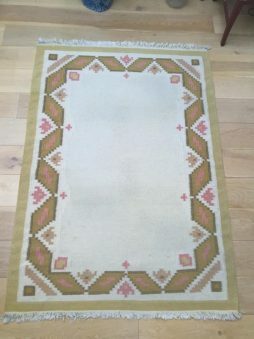 An unsually large Swedish handwoven rug in near perfect condition. A wonderful mix of colours which works beautifully together. 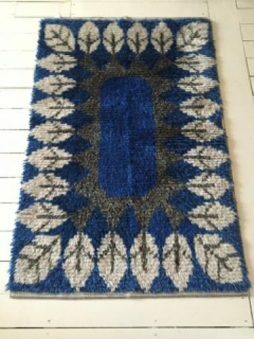 A fabulous Swedish flat weave rug woven and designed by Ingegerd Silow (1916-2005). Made in lovely shades of blue. 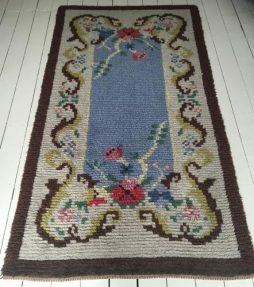 The rug is in very good condition. Ingegerd Silow was born in Stockholm. She became a textile designer after studying at the The School of Art and Design. She later exhibited her work at The National Museum in Stockholm.